Download our Pharma Multi-channel Marketing Maturity Model which provides a useful one-page ready-reckoner to see where you are on your multi-channel marketing journey. We here at Owen Health believe it’s so important for pharma Brand Managers to be able to gauge how well they're developing their multi-channel marketing capability that we’ve created this Multi-channel Marketing Maturity Model specifically for pharmaceutical businesses to do just that. 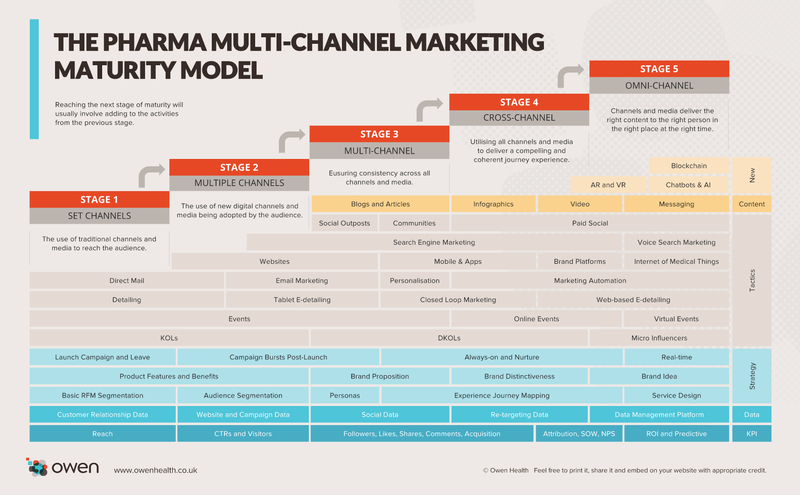 This Pharma Multi-channel Marketing Maturity Model provides a useful one-page ready-reckoner to see where you are on your multi-channel marketing journey. Measuring the performance of multi-channel marketing becomes more sophisticated as digital channels are introduced, the overall number of different media increases, the pressure to measure outcomes over outputs and with the introduction of predictive data modelling. The sources of data increases as more digital media and channels are adopted. Together these data sources have created huge amounts of data which ultimately need to be intelligently aggregated if the business is to extract insights and power high performing data-driven multi-channel marketing programmes. We’ve identified three broad strategic approaches. The first is the approach to stakeholder audience segmentation, the second is the approach to brand marketing and the third is the addition of an always-on approach to campaign activity — sometimes referred to as fireworks and bonfires. Although the key tactics broadly remain throughout the maturity stages, they tend to evolve as they move onto digital channels and media. However, one of the biggest changes we’re expecting to see over the next few years is the shift from keyword-based search to voice-based search. Moving from text to image based content and then onto video was inevitable as the bandwidth of connectivity increased. However, the use of content which is native to new media, such as feed-based content on social networks, is more difficult to predict and can only really be identified through ongoing research. And lastly, we’ve highlighted a few new(ish) innovations which pharma brand managers will need to keep their eye on. Some multi-channel marketers that use the 70:20:10 approach to budget allocation will already be testing these innovations and therefore they could well become integral parts of a pharma multi-channel marketing plan in the not too distance future. We hope our Pharma Multi-channel Maturity Model proves to be useful in your multi-channel marketing efforts. You can download a hi-res copy from the slideshare link here, please feel free to print it, share it and embed on your website with appropriate credit.